Meow, it’s Monday. I thought I’d start the week off with a cute cat quiz that my author found on Facebook. Try your paws at it to see how much you know about felines. Debbie had a great score, but she got a few wrong and learned some things. Also, if you haven’t signed up for Debbie’s newsletter, you’ll miss her March edition that comes out this Wednesday, March 1st, that will feature a contest for two of her eBooks and a gift certificate. Subscribe at https://debbiedelouise.com to be eligible to win. Debbie has a monthly contest and also shares all her book news in her twice-monthly newsletter. Best whiskers on winning. Wow, M eow! I have very exciting mews to share with you readers. First, my second mystery, Between a Rock and a Hard Place, has come in #2 in the P&E Reader’s poll for best mystery of 2016. I credit my pawsome acting but must also acknowledge Debbie’s talented writing. Thanks to all who voted for our book. You guys are pawsome, too. Debbie’s short story, The Path to Rainbow Bridge, although it didn’t feature yours truly, was full of cats and came in #4 of the best Fantasy of 2016. Other great news is Debbie has a novella and short story coming out on Valentine’s Day. Both of them also feature cats. Roxie, is a female Siamese owned by a jewel thief in When Jack Trumps Ace. In Debbie’s historical/paranormal romance, The Seashell and the Stone, there is an orange male cat named Seashell (and I thought Sneaky was a weird name). The last piece of mews I have is that Debbie just signed for our third mystery, Written in Stone with our wonderful publisher, Solstice Publishing (who came in #2 of publishers in the P&E poll). She’s working with a great editor, Cynthia Ley, on that book as well as the reprinting of our first mystery, A Stone’s Throw. Both books may be out this spring. I am so proud of Debbie and all of you readers supporting us that I’m going to have a catnip party to celebrate. I might even ask Debbie to break out the wine from the Winery at Marjim Manor that has her cat Oliver’s label on it, but I think she’s saving that for a souvenir. I hope to be back with more cat character interviews soon. Don’t forget to tell your authors that I am seeking more guests. I will even interview dogs and other animal characters. I’m always up for a challenge. To apply as a guest on my blog, just email Debbie at debbiewriter@yahoo.com. Ok, folks, so I wasn’t chosen to be the character to host the first Cobble Cove Character chat today. Alicia, Debbie’s main character has that honor, but I am sure she will do a great job answering your questions about her role in our series and our books. Also, she has been kind enough to offer a $5 Amazon gift card to the person who posts a question before midnight tonight, Wed, December 7. So don’t pussyfoot around. 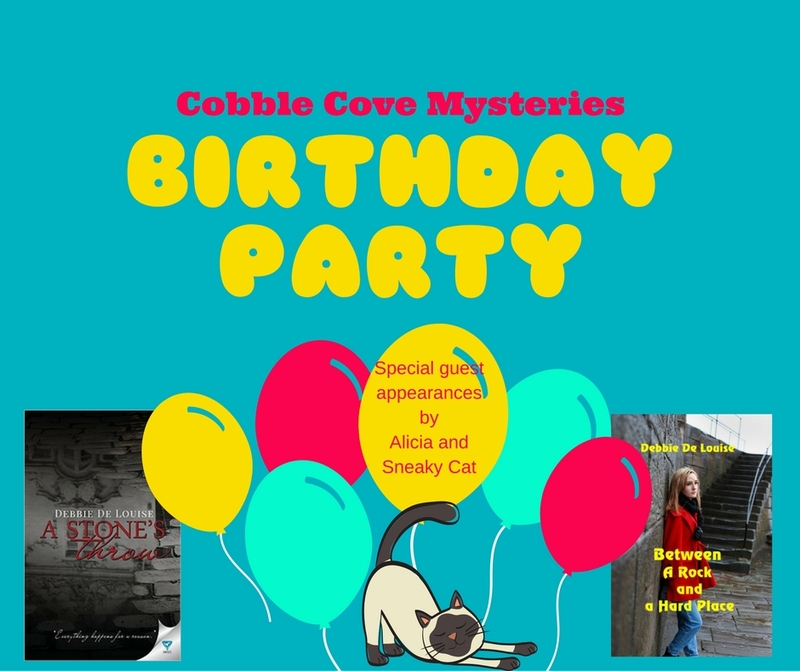 Ask Alicia anything (please keep it kitten-rated, though) and related to the Cobble Cove mysteries. She will do her best, using her librarian skills, to answer your questions quickly and accurately. To start your week off a little micer, I have some pawsome news to share. My author is sponsoring a holiday contest with a purrfect prize for her newsletter subscribers and is also hosting a Facebook paw-ty next week with other authors and some characters from her Cobble Cove mysteries including yours truly who will be making a special guest appearance. Paw down this page for fur-ther details about both these upcoming events. In Debbie’s next author newsletter around November 15, she is going to announce a holiday contest with a special prize connected with our second Cobble Cove mystery, Between a Rock and a Hard Place. The contest will run from mid-November to Mid-December. At the end of that time, she will randomly choose a winner from all her newsletter subscribers. The winner will receive the silver serenity photo locket pictured or, based on availability, a similar item. It will make a great holiday gift for yourself, a friend, or a relative (you can even add your cat’s photo inside). If you aren’t already a subscriber to my author’s newsletter, Debbie’s Drafts, you can sign up through the pop-up form at https://debbiedelouise.com or send a request to join with your email address to her at debbiewriter@yahoo.com. I hope you have a pawsome week, and please scratch the dates of both these events on to your calendars.